I've always been vaguely nervous about the whoopie pie-making process, specifically regarding how to get that little domed cake without investing in a special pan. I used a small ice cream scoop (the one I used holds a little over a tablespoon of batter) and plopped them out onto my baking sheet. Sometimes we just need to have faith - and a good recipe in hand - and things work out just fine. You basically can make these any size you like. Mine baked up about 2 1/2 inches in diameter and I liked that. The recipe calls for baking one tray at a time and given the need for room to spread (though I tend to be conservative about how much space I leave so you could probably fit more per sheet), that's a bit of time investment. I made a half recipe so it wasn't too bad but if you decide to bake two trays at a time, rotating the pans midway through baking, I won't tell on you! Allow the little cakes to cool and then gently remove them from your baking sheet - it was easy to do. Then on to the filling, which is fairly basic and a simple mix of: creamy peanut butter, butter, confectioners' sugar, and a little vanilla and salt. I had a feeling the recipe was a little skimpy on the filling. I increased the amount slightly (which is really not hard to do since you can add a bit more peanut butter and adjust the consistency with confectioners' sugar to thicken or a splash of milk should you need to loosen it) but I still ran a teeny bit short so I had 2 cakes leftover. Once you put them together and make these little cake sandwiches, you just can't help but think they're just kind of cute! And they sure are fun to eat, leaving you with sticky fingers and mouthfuls of soft, spongy chocolate cake and lingering taste of fragrant, creamy peanut butter. Incidentally, the recipe has a suggested optional chocolate ganache glaze you could make and dip the tops of your whoopie pies in. I opted to omit that for a few reasons including the fact that I couldn't see myself handling these soft cakes agilely enough. That said, a thin layer of ganache, maybe not on top but spread onto the flat bottom of one of the cake layers would be a great way to heighten the chocolate flavor. So now...what do you do when you have a couple of whoopie pie shells left over? You make a whoopie pie ice cream sandwich, of course! This was a no-brainer because the chocolate cake reminds me of a fluffier version of your traditional ice cream sandwiches - the rectangle ones made with that chocolate cake biscuit with the little holes in them. I went a little overboard on the ice cream in this ice cream sandwich but it was yummy! * If you like a fairly generous amount of filling for your whoopie pies, you might consider making a little extra. Otherwise, you can always sandwich any extra cakes with ice cream to make "whoopie pie ice cream sandwiches". Sift flour, cocoa, baking soda, baking powder, and salt together into a bowl. In the bowl of a stand mixer fitted with a paddle attachment, beat butter at medium-speed until soft and creamy. Add both sugars and beat until blended, about 2 minutes. Add egg and beat for 2 minutes. Beat in vanilla. Then reduce mixer speed to low and add the dry ingredients alternately with the milk, adding the dry ingredients in 3 additions and the milk in 2, starting and ending with the dry. Mix only until ingredients are just incorporated. The batter should look thick, smooth, and silky. Use a small ice cream scoop (mine holds a little more than 1 tablespoon of batter) and drop mounds of batter onto the prepared baking sheet, leaving 2 inches of space between each. (If you are using a whoopie pie pan, fill the molds with batter.) You'll have to work in batches so cover the batter and set aside in between baking. Bake for 8-10 minutes, until cakes puff and spring back when lightly touched; a cake tester inserted into the center should come out clean. Remove from the oven and carefully slide the parchment paper or silicon mat with the cakes on top of a wire rack. Let cool 5-10 minutes, then gently remove the cakes and set them on a rack to cool completely. Repeat with remaining batter, using fully cooled pans to bake each batch. Make filling: Place all ingredients into the bowl of a stand mixer fitted with the paddle attachment. Beat on medium-high speed until filling is soft, fluffy, and smooth, about 3 minutes. Finish whoopie pies: Transfer filling to a piping bag fitted with a plain or star tip, or use a zip-lock bag with a corner snipped off. Pipe about a tablespoon or so of filling onto the flat side of half the cakes; top each with the other half, flat side down. Gently twist the tops to ease the filling to the edges. Store whoopie pies in the refrigerator, in an airtight container. Bring to room temperature before serving. 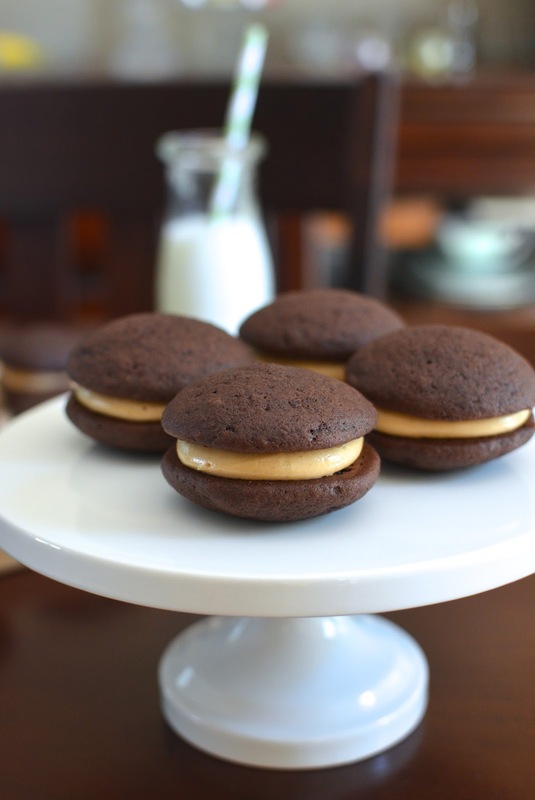 These whoopie pies look so lovely and peanut butter filling is my FAVOURITE! Those look awesome! Definitely my kind of whoopie pie :) I really ought to try making whoopie pies, never actually made one of my own!! Hope you do! These were easy to make. Thank you! These look amazing, Monica! I've only ever tried making whoopie pies once and they fell flat so I love how fluffy and and light yours are. The chocolate and peanut butter combo sound perfect and I love that you filled the leftover ones with ice cream. I wouldn't be able to resist sneaking a couple of these every time I walked by, they're so adorable! I always envisioned a pool of cake batter when I thought of making whoopie pies without any special pans. I think we just need to arm ourselves with a good recipe and you can't go wrong with Dorie...she probably tests her recipes a dozen times before going to print. : ) Thanks, Kelly..stay cool! I haven't made too many whoopie pies in my day, but I do so love anything with chocolate and peanut butter. Amazing! Isn't it wonderful to find that you DON'T need another special pan for a recipe! :) Your whoopie pies look luscious! The combination of peanut butter and chocolate usually is! I really like the idea of adding some ganache to the center for a decadent treat. The few whoopie pie recipes I have made, have used a marshmallow cream filling. Now you have me thinking about a marshmallow based filling that is peanut butter flavored. I'm going to look into that! Yes, it certainly is! I also am thinking too much about that ganache layer and wondering how much better these would have tasted! : ) I did have a bit of cream in the fridge and I was tempted but it's so busy these days and I needed to keep it simple. I'd love to see how a pb-marshmallow filling turns out. Sounds delicious! These whoopie pies look delicious! Love the chocolate and pb combo! so lovely, Monica! i've never made whoopie pies, but they are super cute and i love that yours have the "skimpy" filling: i'm way more Team Cake than Team Frosting/Filling anyway. :) I'm tempted to make these for sure. We are kindred bakers Monica! I have always thought about making Whoopie Pies! I used to work for a company that required occasional travel to Portland Maine. They love their whoopie pies up there and they were delicious! I used to carry boxes of them back for the staff :) Anyway - yours are gorgeous! Love peanut butter and chocolate so I know I would hurt myself on these adorable cakes. Great post! I know there's the debate about whoopie pies starting in Maine or PA. I'd love to try one from either place!! I have yet to have a "real" one and would love to compare. Those whoopie pie are the best I've seen. Looks perfect, and baked so well. The best part about it is no special pans and mini cakes and cookies in one. I haven't made one in a while. That combo sounds good and hey, filling it with icecream even better. haha - yes, the ice cream sandwich is probably my fave. Ice cream is a weakness of mine. Thanks, Ashley! Oh I love love love whoopie pies Monica! Actually I have never come across them in Australia other than my own baking which is such a pity! The ice cream sandwich idea is fabulous..I am going to stuff mine with ice cream next time for sure. Peanut butter and chocolate...I am yet to jump into that bandwagon but your description is so damn tempting. And of course they look DIVINE! I'd love to see your whoopie pies! I am very interested in trying more now. We were in Maine (one of the places thought to be responsible for it) and we've certainly been to Pennsylvania but I've never come across them! I've never tried a whoopie pie before, but looking at yours, I'm definitely heading to the kitchen to whip some up soon, the ice cream version is seriously looking too good! Nothing beats that chocolate and peanut butter combo. The Whoopie Pies that I've had have been sandwiched together with marshmallow (just in case you're looking for a non buttercream filling)! I hear you and I wouldn't mind trying. Thanks, Lorraine. I Have not had a whoopie pie in years, these are so adorable. Clever to make the remaining 2 into ice cream sandwiches. Making them a little smaller makes them even cuter, I think. Glad you like the ice cream sandwich version. I got a little too enthusiastic with the ice cream but that soft cake is very good for it! Thanks, Monica. Peanut butter gets us through a lot, and so does chocolate! I love this whoopie pie recipe because it does not have shortening as a main ingredient for the filling, and therefore a much more tasty and more nutritious treat.